This weekend is full of great events, perfect for anyone. Between the Florence Winter Music Festival, the Oregon Truffle Festival, Nat Geo Live! at the Hult Center, and everything else in between, this weekend will keep you busy. The Lane County History Museum is hosting a Trivia Night at 5th Street Market. Your knowledge of local and world history will be tested, as well as any other random tidbits you may know. Come score some trivia points while enjoying some food and drinks. Free and family friendly! It’s Oregon Truffle Festival weekend! This festival celebrates the Oregon truffle, a delicacy found throughout the Willamette Valley, and highlights the truffle’s uses, history, and cultivation practices. There are many ways to experience the festival, including the Truffle Dog Championship, a foraging workshop, delicious meals, and a fresh truffle marketplace. Pick your experience package for the weekend on their website. Some of the world’s most talented canine truffle hunters will be competing in the Joriad Truffle Dog Championship on Thursday as part of the Oregon Truffle Festival. The first round of qualifying events will take place at the Lane Events Center and then the top dogs take to the forest for the finals. Unfortunately, the finals are not open to spectators, but ticket holders are invited to attend the Awards Ceremony and Parade of Dogs that evening. Shelton McMurphey Johnson House will be hosting their first Jazz in the House concert series on Friday, which will continue every last Friday of the month. Sarah B. Rose, The Jazz Singer, will be kicking off this series with her interpretations of the Great American Songbook. Space is limited, so get your tickets now! Machinal, written by Sophie Treadwell and directed by Ellen Gillooly-Kress, is premiering at the Hope Theatre this Friday. Inspired by the life of Ruth Snyder, the play follows a stenographer who follows the path of marriage and children that she thinks she’s supposed to. It doesn’t end well after she pursues an affair. See their schedule for a full list of performance dates and times. This weekend, The Very Little Theatre is premiering Blithe Spirit, a comedy about marriage, love, and death. Written by Noel Coward and directed by Karen Scheeland, performances will continue through February 9. See their schedule for a full list of performance dates and times. VLT will be offering two tickets to any performance to any furloughed government employee. Head to the coast for a weekend of music, arts, and delicious food for the 17th annual Florence Winter Music Festival. Starting Friday, Florence is welcoming 11 bands, hosted at the Florence Events Center. Each day will center around acoustic music, with bluegrass on Friday, Americana on Saturday, and gospel on Sunday. Saturday evening will also feature headliner John McEuen, founding member of the Nitty Gritty Dirt Band, who is currently on the Will the Circle Be Unbroken tour with The String Wizards. Eugene Mindworks is hosting an air plant tutorial and the opportunity to decorate your own wood vessel air plant home on Saturday. You’ll be able to paint your wood vessel (or keep it simple) and then decide how you want the copper wire to hold your plant. Register at the website below! For this month’s creative workshop, the OSLP Arts and Culture Program is leading a class focusing on lettering, all within in the theme of “love.” Taught by Judy Black and Heidi Stolp, they will provide all the supplies to make your own cards and envelopes and share calligraphy examples to inspire you. All levels of skill and experience are welcome! Register on their website. Maude Kerns Art Center is hosting an open house to celebrate their members and welcome all to see their newly refurbished Print Studio at Photography Darkroom Studio. Come meet the staff and take in their latest exhibit while enjoying some wine and cheese. The Grand Truffle Dinner features our area’s native white and black truffles in a six-course meal, all paired with wines from across Oregon. 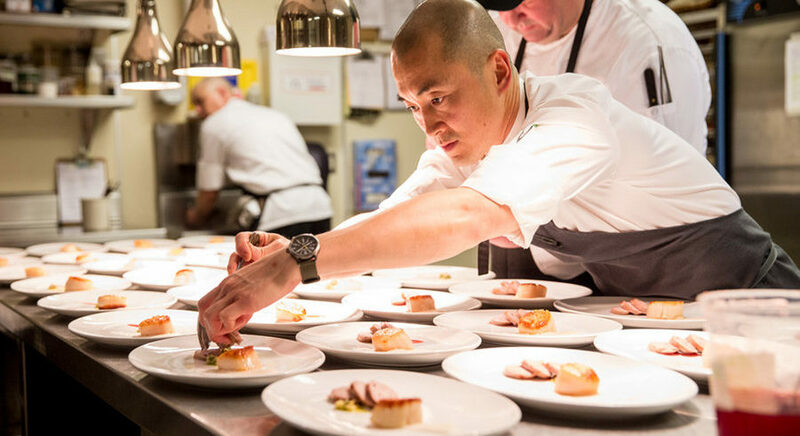 All food will be prepared by celebrated chefs, including Greg and Gabi Denton, Gregory Gourdet, Eric Tanaka, Tobi Sovak and Michael Landsberg, Thomas and Mariah Pisha-Duffly, Matt Christianson, and Shane Tracey. Fresh truffles, area wines, perfectly paired foods, and truffle-related craft products will all be on display at the Fresh Truffle Marketplace on Sunday. There will also be tasting opportunities and demonstrations so you can learn from the best. Why is olive oil so common in cooking? What’s the real difference between regular olive oil and EVOO? Learn the answers to these and other questions at Olive Oil 101, Take Two, offered by Provisions this Sunday. You’ll explore multiple olive varietals, sample some food pairings, and much more. Register online. Photographer Florian Schulz is presenting the best of his time in the Arctic, where he camped for weeks, hung out with traditional Inuit hunters, and sailed the icy waters. He wanted to capture the life in the cold wilderness, which he will be showcasing at the Hult Center on Tuesday. Placido’s Pasta Shop, in their new home in the Mahonia Building, combines Pacific Northwest flavors with chef and owner Joe Placio’s love for Italian cooking. This comes through in their menu, like with the smoked salmon alfredo. They focus on sustainable practices, using local and organic ingredients for all tastes. Try their Arrabiata with Italian sausage, tomatoes, and marinara tossed with rigatoni, or, for a vegan option, “The Walrus,” which includes an eggless rigatoni with mixed veggies and marinara.